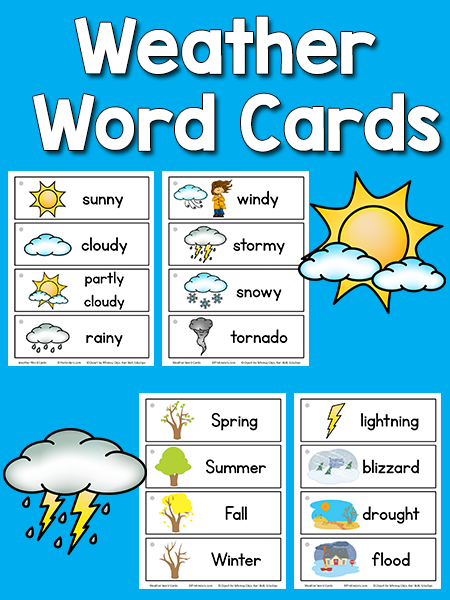 This set of Weather Picture Word Cards can be added to your Writing Center during a Weather Theme. I have included all kinds of weather, with words like sunny, cloudy, stormy, as well as blizzard, flood, hurricane, the four seasons, and others. There are a total of 20 words. Find more word card sets in the Picture Word Cards collection, and more weather printables here. You can use the cards displayed in a pocket chart or make a picture dictionary. I usually use a pocket chart to display the picture-word cards. The kids can take them out of the pocket chart and take them to the table if they want to copy the word. To make picture dictionaries, use the gray dot to punch a hole in the corner and bind them together with metal binder rings. This works well if you don’t have the space for a pocket chart, or if you like to keep several different sets of word cards in the writing center during the year. Use the blank set to write words in other languages or other writing styles (e.g. D’Nealian). Graphics licensed by Whimsy Clips, Kari Bolt, & Educlips. Thanks! Glad you and your students are enjoying them! Thanks indeed for your word cards. These are a wonderful addition to my word cards. Thank you for sharing them! Wow, right on time! I am doing a lesson plan project about weather for my class and this is just what I needed. Thanks! 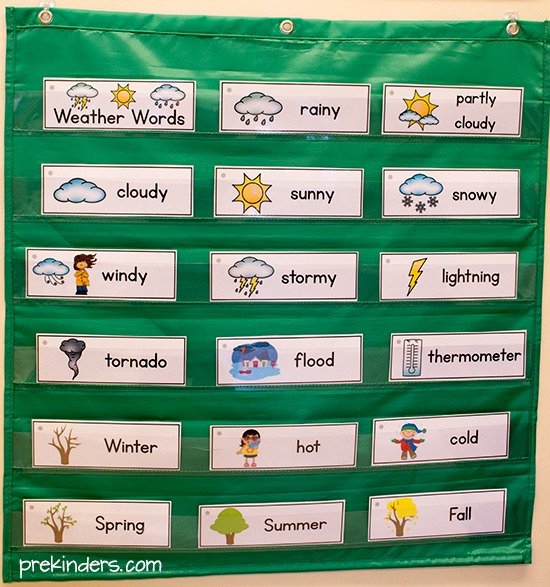 Your weather cards are nice & it’s a great learning idea for preschoolers. We do this daily in my class but are not able to use many of the cards. We live in San Diego & 9 times out of 10 the children pick the sunny card! Super thanks! I’m using these tomorrow to start my grandson on weather work! Perfect timing because I am getting my materials ready for the next two weeks of curriculum. One of the Units of Learning is Weather, Wind, and Clouds. Your site is very resourceful especially for a first year teacher such as myself. Thank you Karen for sharing your valuable knowledge again. I liked the weather words. thanks you very much!!!!! these cards are really useful for my kids!!!!! Thanks for sharing the weather pics. They r a great help!! Thank you Karen for your innovative weather cards and I am doing hey diddle diddle in my story times this week so the story sequencing cards have come in handy! Brilliant! keep up the good work.. Thanks this so helpful for my students. Thank you so much for the Weather Cards. I printed several other word card sets to use with each of our classroom themes. I am a pre-k teacher with 30+ years of classroom experience , 15 years in the early childhood grades. I am always looking for how I can improve on working with my little ones and choosing resources that will effectively support them in their learning ( and are Developmentally Appropriate) . I really appreciate your site and materials . Thank you so very much !! Thanks Karen, the new weather pictures and words will work wonderfully in my circle time lesson. I can also use it for workstation lessons. I love your word cards! Thanks for the blank ones! We do upper case writing mostly in our PreK class, so having the blank ones is helpful. We are currently working on re-vamping our curriculum and have begun to discuss whether we teacher upper or lower case in PreK. We use Handwriting Without Tears curriculum which encourages upper case first because they are easier to write. Although, one the kids get to Kindergarten they are expected to write in lower case! We are trying to figure out if we should do both or maybe switch half way through the year to get ready for K. What are your thoughts/philosophy about teaching either or both? Thanks! I use lowercase letters as much as possible in my classroom, no matter what it is: the word cards as well as letter games. When you open up a book, the majority of letters are lowercase. Since kids are expected to learn to read in Kindergarten these days, I feel that the lowercase letters are so important. I do teach both uppercase & lowercase. When the Kindergarten teachers test kids in my county, they ONLY test lowercase letters, they don’t even ask them to identify uppercase. I have not used Handwriting Without Tears or read any of their books, so I can’t really comment on that. Where do you get the pocket Chart holder we are just starting out with homeschooling and found your site it has been a life saver. Thank you so much!! I buy my pocket charts from Lakeshore Learning. There are many other places: Amazon, ReallyGoodStuff.com, Staples.com, CarsonDellosa.com to name a few. I think this is the one from the picture: https://www.lakeshorelearning.com/products/teaching-resources/pocket-charts-accessories/heavy-duty-small-pocket-charts/p/LK522. I also love their magnetic pocket chart.